I shared data a couple of weeks ago showing that Florida is the freest state in America (for both overall freedom and economic freedom) while New York is in last place (in both categories). We’ll start with an op-ed in the Miami Herald by Ed Pozzuoli. In a recent press conference, New York Gov. 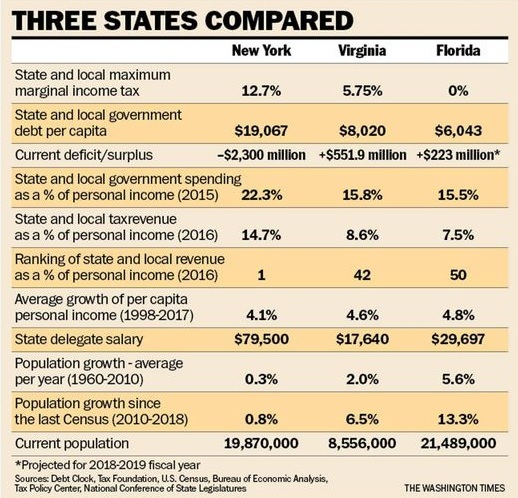 Andrew Cuomo…mentioned Florida as an attractive option for New Yorkers who are unhappy… a Census Bureau report late last year detailing the states that lost residents because of high taxes, overregulation and dwindling opportunities. Leading the list? New York. …what jurisdiction did the Census folks say benefits the most from domestic “in-migration? You guessed it — Florida… our low-tax, business-friendly welcome to asylum seekers from Big Government states like New York… It’s Florida’s low taxes and reasonable regulatory environment that attract businesses here. Florida ranks sixth among states for new business creation. …Unlike the federal government, Florida balances its budget and does so without an income tax. New York can keep its big progressive government. And that “big progressive government” means onerous and punitive taxes, as the Wall Street Journal opined. New York City’s combined state and local top rate of 12.7% hits taxpayers earning more than $1 million and is the second highest in the country after California. The deduction limit raised New York’s top rate by an effective 5%, though this was partially offset by the tax reform’s 2.6 percentage-point reduction in the federal top rate. …According to IRS data we’ve examined, New York state lost $8.4 billion in income to other states in 2016 (the latest available data), up from $4.6 billion annually on average during the prior four years. Florida raked in the most New York wealth. Mr. Cuomo says that “a taxpayer in Florida would see no increase, or a decrease” under the GOP tax reform and “Florida also has no estate tax.” New York’s 16% estate tax hits assets over $10.1 million. …Mr. Cuomo promised to let New York’s tax surcharge on millionaires expire. But he has extended it again and again and now wants to renew it through 2024 because he says the state needs the money. Meantime, he warns that a wealth exodus could force spending cuts for education and higher taxes on middle-income earners. All of this was inevitable, as we and others warned. Yet rather than propose to make the state’s tax burden more competitive, Mr. Cuomo rages against a tax reform that has helped the overall U.S. economy, even in New York. I especially enjoy how Governor Cuomo is irked because his state’s profligacy is no longer subsidized by an unlimited federal deduction for state and local taxes. Investor’s Business Daily shares a similar perspective. New York Gov. Andrew Cuomo…we appreciate his recent frankness on taxes. …”I don’t believe raising taxes on the rich,” Cuomo said. “That would be the worst thing to do. You would just expand the shortfall. God forbid if the rich leave.” …In support of his comments, Cuomo cited “anecdotal” evidence that showed high-income earners are leaving the high-tax Empire State for other low-tax states. But the evidence isn’t merely anecdotal. It’s a fact. …From 2010 to mid-2017, New York had a net outmigration of over 1 million people, more than any other state. No, they’re not all rich. But many are. …the wealthy have choices that others don’t. One of those choices is to move if taxes become not merely burdensome, but punitive. That’s what’s happening in New York. …Many high-income taxpayers are leaving New York for low-tax states, tired of paying the state’s bills and then being demonized leftist activists for being “rich” and told they must give more. Let’s close with some excerpts from a column in the Washington Times by Richard Rahn. He compares New York, Virginia, and Florida. …many high-income New Yorkers have been moving their tax homes to Florida, undermining the New York tax base. …Florida imposes no state and local income taxes… Florida is booming, with a budget surplus, while New York is mired in debt. Only 50 years ago, New York had four times the population of Florida, and now Florida is larger than New York. …the state of Florida…created an environment where businesses could flourish without undue tax burdens and government interference. It went from being a poor state to a prosperous one. …citizens of New York should be asking: Why they are required to pay such high state and local income tax rates while the citizens of Florida get by perfectly well without any state income tax; Why they have three times more per capita debt than Floridians, and infrastructure that is in far worse shape; …Why it takes a third more of their citizens’ personal income to run the government than in Virginia or Florida; Why their state takes twice the percentage of per capita income in taxes than Virginia and Florida; …When it comes to taxes and government services, people’s feet tell more about how they feel than their mouths. And if you want to know why so many people are traveling down I-95 from New York to Florida, this table from Richard’s column tells you everything you need to know. For what it’s worth, there are people who are willing to pay extra tax to live in certain high-tax states. New York City has an allure for some people, as does California’s climate and scenery. But are those factors enough to compensate for awful tax systems? Will they save those states from economic decay? At best, they’ll delay the day of reckoning. For what it’s worth, I actually think New Jersey or Illinois will be the first state to fiscally self-destruct. You can cast your vote by clicking here. Did Migration to America Make Scandinavia More Collectivist? 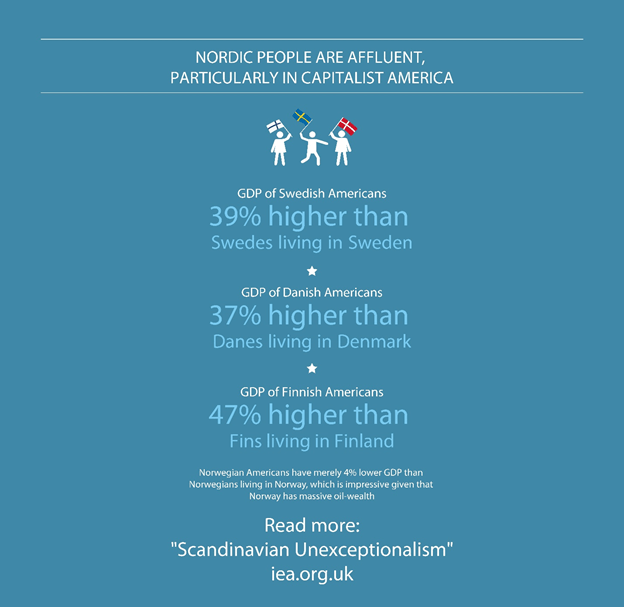 The most persuasive data, when comparing the United States and Scandinavia, are the numbers showing that Americans of Swedish, Danish, Finnish, and Norwegian descent produce much more prosperity than those who remained in Sweden, Denmark, Finland, and Norway. This certainly suggests that America’s medium-sized welfare state does less damage than the large-sized welfare state in Scandinavian nations. But maybe the United States also was fortunate in that it attracted the right kind of migrant from Scandinavia. Let’s look at some fascinating research from Professor Anne Sofie Beck Knudsen of Lund University in Sweden. If you’re in a rush and simply want the headline results, here are some excerpts from the abstract. 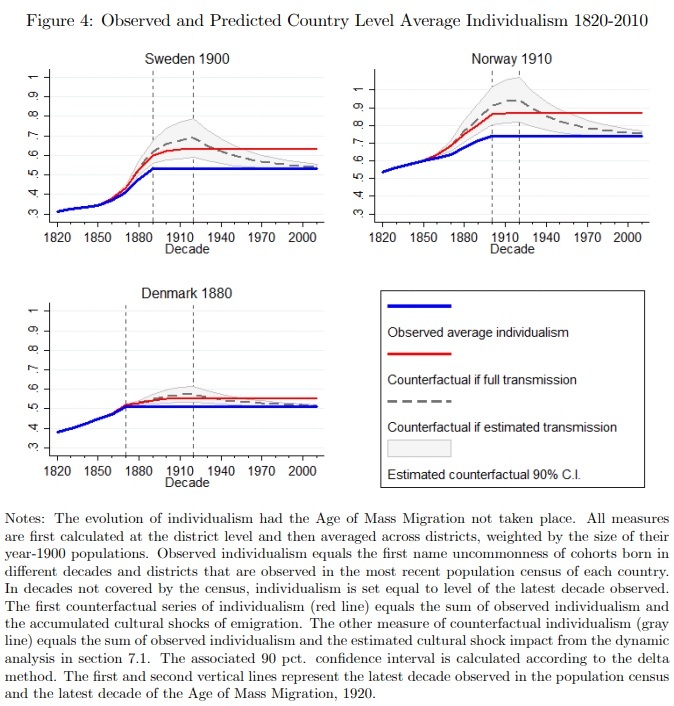 This paper examines the joint evolution of emigration and individualism in Scandinavia during the Age of Mass Migration (1850-1920). A long-standing hypothesis holds that people of a stronger individualistic mindset are more likely to migrate as they suffer lower costs of abandoning existing social networks. …I propose a theory of cultural change where migrant self-selection generates a relative push away from individualism, and towards collectivism, in migrant-sending locations through a combination of initial distributional effects and channels of intergenerational cultural transmission. …the empirical results suggest that individualists were more likely to migrate than collectivists, and that the Scandinavian countries would have been considerably more individualistic and culturally diverse, had emigration not taken place. If you’re interested in more detail, here are passages from the study. We’ll start with the author’s description of why she studied the topic and what she wanted to determine. People of Western societies are unique in their strong view of themselves… This culture of individualism has roots in the distant past and is believed to have played an important role in the economic and political development of the region… differences in individualism and its counterpart, collectivism, impact processes of innovation, entrepreneurship, cooperation, and public goods provision. Yet, little is known about what has influenced the evolution of individualism over time and across space within the Western world. …I explore the relationship between individualism and a common example of human behavior: migration. I propose a theory, where migration flows generate cultural change towards collectivism and convergence across migrant-sending locations. Keep in mind, by the way, that societies with a greater preference for individualism generate much more prosperity. Anyhow, Professor Knudsen had a huge dataset for her research since there was an immense amount of out-migration from Scandinavia. During the period, millions of people left Europe to settle in New World countries such as the United States. Sweden, Norway, and Denmark experienced some of the highest emigration rates in Europe during this period, involving the departure of approximately 25% of their populations. …Total emigration amounted to around 38% and 26% in Norway and Sweden respectively. Here are some of her findings. I find that Scandinavians who grew up in individualistic households were more likely to emigrate… people of individualistic mindsets suffer lower costs of leaving existing social networks behind… the cultural change that took place during the Age of Mass Migration was sufficiently profound to leave a long-run impact on contemporary Scandinavian culture. …If people migrate based, in part, on individualistic cultural values, migration will have implications on the overall evolution of cultures. Emigration must be associated with an immediate reduction in the prevalence of individualists in the migrant-sending population. Here is her data on the individualism of emigrants compared to those who stayed in Scandinavia. …historians agree that migrants were motivated by more than hopes of escaping poverty. Stories on the ‘American Dream‘ and the view of the United States as the ‘Land of Opportunities‘ were core to the migration discourse. Private letters, diaries, and newspaper articles of the time reveal that ideas of personal freedom and social equality embodied in the American society were of great value to the migrants. In the United States, people were free to pursue own goals. And this is why I am quite sympathetic to continued migration to America, with the big caveat that I want severe restrictions on access to government handouts. But I’m digressing. Let’s now look at the key result from Professor Knudsen’s paper. When the more individualistic Scandinavians with “get up and go” left their home countries, that meant the average level of collectivism increased among those remained behind. Several observations are worth mentioning in light of the revealed actual and counterfactual patterns of individualism. First, one observes a general trend of rising individualism over the period, which is consistent with accounts for other countries… Second, the level of individualism would have been considerably higher by the end of the Age of Mass Migration in 1920, had emigration not taken place. Taking the numbers at face value, individualism would have been between 19.0% and 20.3% higher on average in Sweden, 17.8% and 27.9% in Norway, and 7.6% and 12.5% in Denmark, depending on the measure considered. These charts capture the difference. To wrap this up, here’s a restatement of the key findings from the study’s conclusion. 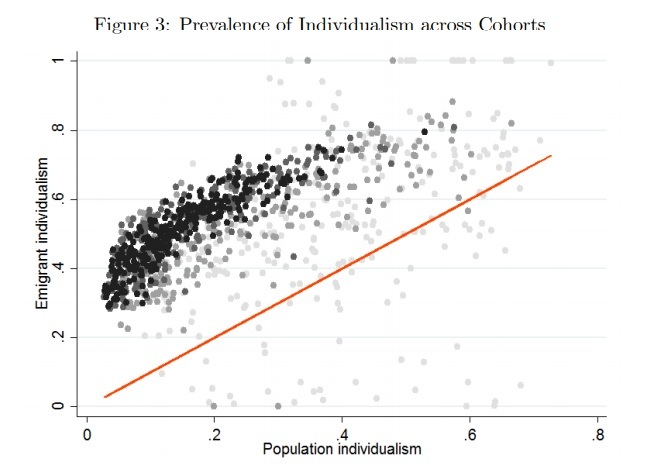 I find that people of an individualistic mindset were more prone to migrate than their collectivistic neighbors. …Due to self-selection on individualistic traits, mass emigration caused a direct compositional change in the home population. Over the period this amounted to a loss of individualists of approximate 3.7%-points in Denmark, 9.4%-points in Sweden, and 13.6%-points in Norway. …The cultural change that took place during the Age of Mass Migration was sufficiently profound to impact cross-district cultural differences in present day Scandinavia. Contemporary levels of individualism would thus have been significantly higher had emigration not occurred. …The potential societal implications of the emigration-driven cultural change are of great importance. The period of the Age of Mass Migration was characterized by industrialization, urbanization, and democratization in Scandinavia. Individualism was generally on the rise, in part due to these developments, but it seems conceivable that the collectivistic turn caused by emigration played a role in subsequent institutional developments. While economic freedom is high in contemporary Scandinavia, the region is known for its priority of social cohesion and collective insurance. This is particularly clear when contrasting the Scandinavian welfare model with American liberal capitalism. Professor Knudsen even understands that Scandinavian nations still have lots of economic freedom by world standards. Imagine, though, how much economic freedom those countries might enjoy if the more individualism-minded people hadn’t left for America? Maybe those nations wouldn’t have dramatically expanded their welfare states starting in the 1960s, thus dampening economic growth. The obvious takeaway is that migration from Denmark, Sweden, and Norway to the United States was a net plus for America and a net minus for Scandinavia. P.S. When she referred in her conclusion to “American liberal capitalism,” she was obviously referring to classical liberalism. I’ve written many times about people and businesses escaping high-tax states and moving to low-tax states. This tax-driven migration rewards states with good policy and punishes those with bad policy. And now we have some new data. The Wall Street Journal recently opined on the updated numbers. …some states are booming while others are suffering a European-style sclerosis of population loss and slow economic growth. …The eight fastest-growing states by population last year…also experienced rapid employment and GDP growth spurred by low tax rates and policies generally friendly to business and job creation. Nevada, Arizona, Texas, Washington, Utah, Florida and Colorado ranked among the eight states with the fastest job growth this past year, according to the Bureau of Labor Statistics. Nevada, Texas, Washington and Florida have no income tax. …Then there’s California. Despite its balmy weather and thriving tech industry, the Golden State last year lost more people to other states than it gained from foreign immigration. Since 2010, a net 710,000 people have left California for other states. …New York Gov. Andrew Cuomo recently blamed cold weather for the state’s population exodus, but last year frigid New Hampshire with no income tax attracted 3,900 newcomers from other states. …Illinois’s population has declined by 157,000 over the past five years… Cold weather? While Illinois’s population has declined by 0.8% since 2010, Indiana’s has grown 3.1% and Wisconsin’s by 2.2%. Here’s my favorite part of the editorial. America as a whole can thank the Founders for creating a federalist system that allows the economic and political safety valve of interstate policy competition. Amen. Federalism is great for a wide range of reasons, but I especially like that people have the freedom to escape when policy is decentralized. Honeywell International Inc. is snubbing New Jersey and heading south. …Honeywell’s move follows other companies that have moved corporate offices out of states with elevated costs of living and high taxes, including General Electric Co.’s relocation of its headquarter to Boston from Connecticut. Those costs were exacerbated by a new law last year that removed state income-tax deductions on federal taxes. North Carolina has a lower state income tax than New Jersey for higher-paid employees. Former governors escape high taxes. Gov. Paul LePage said Monday that he plans to move to Florida for tax reasons… LePage and his wife, Ann, already own a house in Florida and often vacation there. He said he would be in Maine from April to September. Asked where he would maintain his legal residency, LePage replied Florida. …”I have a house in Florida. I will pay no income tax and the house in Florida’s property taxes are $2,000 less than we were paying in Boothbay. … At my age, why wouldn’t you conserve your resources and spend it on your family instead of on taxes?” …LePage often has cited Maine’s income tax – currently topping out at 7.15 percent, down from a high of 8.5 percent when he took office – as an impediment to economic growth and attracting/retaining residents. Even sports stars avoid class-warfare tax regimes. Bryce Harper and Manny Machado…will “take home” significantly higher or lower pay depending on which teams sign them and the applicable income tax rates in the states where those teams are based. This impact could be worth tens of millions of dollars. …For example, assume the Cubs and Dodgers offer identical eight-year, $300 million contracts to Machado. Lozano would warn the Dodgers that their offer is decidedly inferior. As a Dodger, Machado’s million-dollar wages would be subject to the top bracket of California’s state income tax rate. At 13.3%, it is the highest rate in the land. In contrast, as a Cub, Machado would be subject to the comparatively modest 4.95% Illinois income tax rate. …the difference in after-tax value of these two $300 million contracts would be $14 million. Though Lozano needs to warn Machado that the recent election results significantly increase the danger that Illinois politicians will finally achieve their long-held goal of changing the state constitution and replacing the flat tax with a class-warfare system. Since we’re talking about the Land of Lincoln, it’s worth noting that the editors at the Chicago Tribune understand the issue. Every time a worker departs, the tax burden on those of us who remain grows. The release on Wednesday of new census data about Illinois was alarming: Not only has the flight of citizens continued for a fifth straight year, but the population loss is intensifying. This year’s estimated net reduction of 45,116 residents is the worst of these five losing years. …Residents fed up with the economic climate here are heading for less taxaholic, jobs-friendlier states. …Many of them left because they believed Illinois is headed in the wrong direction. Because Illinois politicians have raised taxes, milked employers and created enormous public indebtedness that the pols want to address with … still more taxation. …How bad does the Illinois Exodus have to get before its dominant politicians understand that their debt-be-damned, tax-and-spend policies are ravaging this state? Wow, no wonder Illinois is perceived to be the first state to suffer a fiscal collapse. Let’s now zoom out and consider some national implications. Chris Edwards took a close look at the data and crunched some numbers. The new Census data confirms that people are moving from tax-punishing places such as California, Connecticut, Illinois, New York, and New Jersey to tax-friendly places such as Florida, Idaho, Nevada, Tennessee, and South Carolina. In the chart, each blue dot is a state. The vertical axis shows the one-year Census net interstate migration figure as a percentage of 2017 state population. The horizontal axis shows state and local household taxes as a percentage of personal income in 2015. 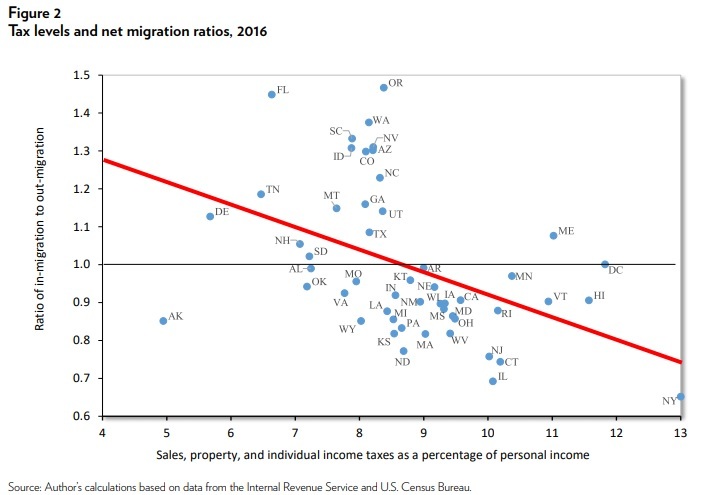 …On the right, most of the high-tax states have net out-migration. …On the left, nearly all the net in-migration states have tax loads of less than 8.5 percent. …The red line is fitted from a simple regression that was highly statistically significant. Professor Glenn Reynolds wrote a column on tax migration for USA Today. He starts by warning states that it’s a very bad recipe to repel taxpayers and attract tax consumers. IRS data show that taxpayers are migrating from high-tax states like New York, Illinois, and California to low-tax states like Texas and Florida. …In time, if taxpayers tend to migrate from high-tax states to low-tax states, and if people receiving government benefits tend to stay in place or migrate from lower-benefit states to higher-benefit states, then over time lower-tax states will tend to accumulate more people with high earnings, while higher-benefit states will tend to accumulate more people who live on the dole. …if high-benefits states are also high-tax states (as is often the case) since then states with high benefits will accumulate more people who draw on them, while shedding the taxpayers they need to support them. The problem is that the result isn’t stable: High-tax, high-benefit states will eventually go bankrupt because they won’t retain enough taxpayers to support their welfare spending. He then makes a very interesting observation about the risk that people who leave states such as New York, Illinois, California, and New Jersey may bring their bad voting habits to their new states. …migrants from high tax states might bring their political attitudes with them, moving to new, low-tax states for the economic opportunity but then supporting the same policies that ruined the states they left. This seems quite plausible, alas, and I’ve heard Coloradans lament that the flow of Californians to their state involved a lot of people doing just that. …If I were one of those conservative billionaires…I might try spending some of the money on some…sort of welcome wagon for blue state migrants to red states. Something that would explain to them why the place they’re moving to is doing better than the place they left, and suggesting that they might not want to vote for the same policies that are driving their old home states into bankruptcy. Glenn makes a very good point. As part of my work on defending TABOR in Colorado, I often run into people who fret that the state has moved in the wrong direction because of migration from left-leaning states. Though Chuck DeVore shared some data on how migrants to Texas are more conservative than people born in the state. I’ll close today’s column with a helpful map from the Tax Foundation. All you really need to know is that you should move if you live in a blue state and you should erect a no-leftists-allowed sign if you live in a gray state. P.S. Everything I wrote about the benefits of tax migration between states also applies to tax migration between nations. I will never stop defending the right of labor and capital to escape high-tax regimes. I especially enjoy the hysterical reactions of folks on the left, who think that my support of fiscal sovereignty means that I’m “trading with the enemy,” being disloyal to my government, or that I should be tossed in jail. Back in April, I chatted with Stuart Varney about how some states were in deep trouble because they were being squeezed by having to finance huge unfunded liabilities for bureaucrats, yet they were constrained by the fact that taxpayers have the freedom to move when tax burdens become excessive. I now have a reason to share the interview because Chris Edwards described this phenomenon of tax-driven migration in a new column for the Daily Caller. New Jersey’s richest person, David Tepper, moved with his hedge fund business to Florida in 2016. That single move cost the state of New Jersey up to $100 million a year in lost income taxes. Yet, this year, New Jersey’s Democratic governor Phil Murphy hiked the top income tax rate from 8.97 to 10.75 percent. Murphy wanted to raise revenue, but the hike won’t do if it prompts more of the rich to leave. The top 1 percent in New Jersey pay 37 percent of the state’s income taxes. Connecticut is also losing its wealthiest residents after tax hikes by Democratic governor Dan Malloy. In recent years, the state has lost stock trading entrepreneur Thomas Peterffy (worth $20 billion), executive C. Dean Metropoulos ($2 billion), and hedge fund managers Paul Tudor Jones ($4 billion) and Edward Lampert ($3 billion). Those folks all fled to Florida, which has no income tax or estate tax. …High taxes are driving the wealthy out of California. Ken Fisher moved Fisher Investments from California to Washington state, which also has no income tax. The billionaire said he wanted a lower-tax location for his 2,000 employees. Mark Spitznagel moved his Universal Investments from California to Florida, saying that “Florida’s business-friendly policies, which are so different from California’s, offer the perfect environment for this.” The “tax freedom exodus” will accelerate in the wake of the 2017 federal tax law. The law capped the deduction for state and local taxes, which subjected 25 million mainly higher-income households to the full tax burden imposed in high-tax states. It’s important to ask, though, whether these moves are a trend or just random. 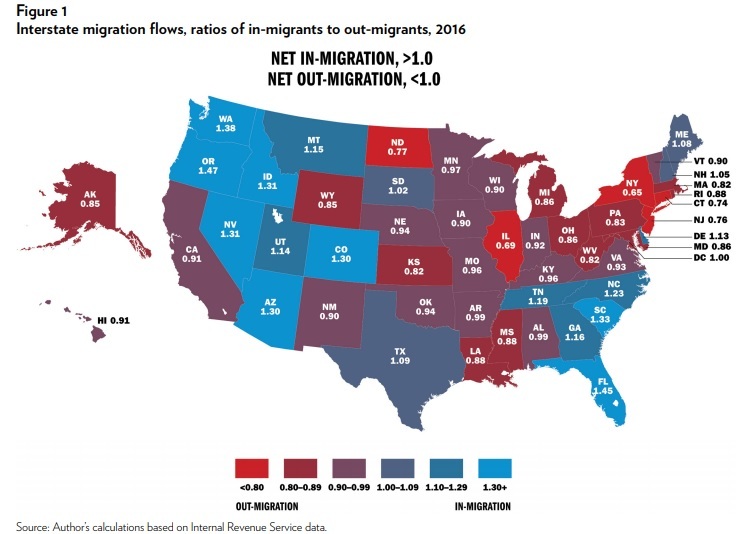 In a more detailed study he produced, Chris crunched that national data and found there is a relationship between tax burdens and migration patterns. It’s not a perfect relationship, of course, since there are many factors that might lead households to move across state lines. But tax is definitely part of the equation, especially since high-tax states no longer receive a big indirect subsidy from Uncle Sam. A column in the Wall Street Journal explores this aspect of the issue. …real-estate professionals say they are beginning to see early signs of an exodus to low-tax states. “I’ve seen a huge increase in the number of clients who want to purchase in Palm Beach to establish residency in Florida,” says Chris Leavitt, director of luxury sales at Douglas Elliman Real Estate in Palm Beach. …Real-estate developer David Hutchinson, president of Ketchum, Idaho-based VP Cos., is touting the tax advantages of living in Nevada on his company website… The border between California and Nevada bisects Lake Tahoe. Californians to the west can pay a state income-tax rate of up to 13.3%, while Nevada residents just 30 minutes to the east pay no state income taxes. A Democratic political consultant warns that his party could be hurt. With state deductions now capped at $10,000, the cost of living in states such as California and New York – where state taxes are notoriously high – is increasing substantially. This has the potential to lead both middle-class families, and even the wealthy, to begin questioning whether it is time to move to a more tax-friendly state. …In one high-profile example of the impact of high taxes, professional golfer Phil Mickelson recently slammed California’s taxes and threated to leave the state. “If you add up all the federal and you look at the disability and the unemployment and the Social Security and the state, my tax rate’s 62, 63 percent,” Mickelson said. …New York Gov. Andrew Cuomo – seeking re-election this year and a potential 2020 Democratic presidential contender – recognizes the threat that tax migration may pose. “If you lose the taxpayers, you lose the revenue,” Cuomo said in December. Here’s another chart from Chris Edwards’ study. The light-blue states are attracting the most new residents (i.e., taxpayers) while the bright-red states (like New York) are losing the most residents (former taxpayers). Needless to say, the states with better tax policy tend to be net recipients of taxpayers, and taxable income. In closing, it’s important to understand that tax-motivated migration also exists between countries. Here are some excerpts from a column in the New York Times. When a country begins to fall into economic and political difficulty, wealthy people are often the first to ship their money to safer havens abroad. The rich don’t always emigrate along with their money, but when they do, it is an even more telling sign of trouble. …In a global population of 15 million people each worth more than $1 million in net assets, nearly 100,000 changed their country of residence last year. …In 2017, the largest exoduses came out of Turkey (where a stunning 12 percent of the millionaire population emigrated) and Venezuela. As if on cue, the Turkish lira is now in a free fall. There were also significant migrations out of India under the tightening grip of its overzealous tax authorities… Millionaire migrations can be a positive sign for a nation’s economy. The losses for India, Russia and Turkey were gains for havens like Canada and Australia, joined lately by the United Arab Emirates. …Millionaires move money mainly out of self-interest, to find more rewarding or safer havens. There aren’t a lot of them, but they can tell us a great deal about what is going wrong — and right — in a country’s economic and political ecosystems. Leaders who create the right conditions to keep millionaires home will find that all of their residents — not just the wealthy ones — are richer for it. I like footloose millionaires because – as discussed in the article – they act as canaries in the coal mine. When they start moving, that sends a helpful signal to the rest of us. And I also cheer migrating millionaires since they can cause big Laffer-Curve effects. And that puts an external constraint on the greed of politicians. Which helps ordinary taxpayers like you and me since politicians generally use higher tax burden on the rich as a softening-up tactic before grabbing more money from the masses. New Jersey is a fiscal disaster area. It’s in last place in the Tax Foundation’s index that measures a state’s business tax climate. It’s tied for last place in the Mercatus Center’s ranking of state fiscal conditions. And it ranks in the bottom-10 in measures of state economic freedom and measures of unfunded liabilities for bureaucrat pensions. All of this led me, last October, to warn that the state was suffering from fiscal decay. Then, two months ago, James Freeman of the Wall Street Journal wrote about how New Jersey’s uncompetitive fiscal system was encouraging highly productive taxpayers to leave the state. The Garden State already has the third largest overall tax burden and the country’s highest property tax collections per capita. Now that federal reform has limited the deduction for state and local taxes, the price of government is surging again among high-income earners in New Jersey and other blue states. Taxpayers are searching for the exits. …says Jeffrey Sica, founder of Circle Squared, an alternative investments firm. “We structure real estate deals for family offices and high-net-worth individuals and at a record pace those family offices and individuals are leaving the TriState for lower-tax states. Probably a dozen this year at least,”…In the decade ending in 2016, real economic growth in New Jersey clocked in at a compound annual percentage rate of 0.1, just slightly higher than John Blutarsky’s GPA and less than a tenth of the national average for economic growth. 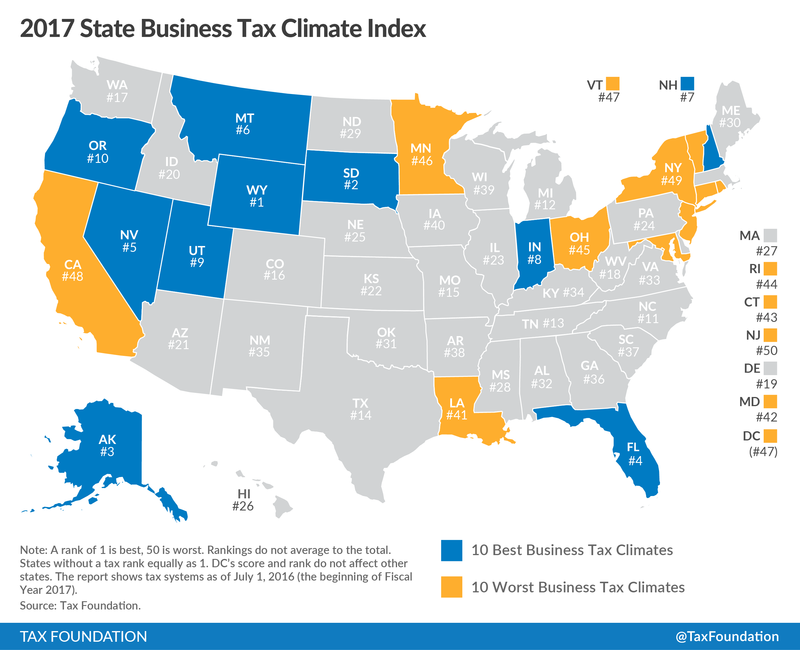 The Tax Foundation ranks New Jersey dead last among the 50 states for its business tax climate. …Steven Malanga calls Mr. Murphy’s plan “the U-Haul Budget” for the new incentives it gives New Jersey residents to flee. You would think that New Jersey politicians would try to stop the bleeding, particularly given the impact of federal tax reform. But that assumes logic, common sense, and a willingness to put the interests of people above the interests of government. Unfortunately, all of those traits are in short supply in the Garden State, so instead the politicians decided to throw gasoline on the fire with another big tax hike. The Wall Street Journal opines today on the new agreement from Trenton. Governor Phil Murphy and State Senate leader Steve Sweeney have been fighting over whether to raise tax rates on individuals or businesses, and over the weekend they decided to raise taxes on both. Messrs. Murphy and Sweeney agreed to raise the state’s income tax on residents making more than $5 million to 10.75% from 8.97% and the corporate rate on companies with more than $1 million in income to 11.5% from 9%. This will give New Jersey the fourth highest marginal income tax rate on individuals and the second highest corporate rate after Iowa. New Jersey is pursuing class warfare, but the politicians don’t seem to realize that the geese with the golden eggs can fly away. The two Democrats claim this will do no harm because about 0.04% of New Jersey taxpayers will get smacked. But those taxpayers account for 12.5% of state income-tax revenue and their investment income is highly mobile. The state treasurer said in 2016 that a mere 100 filers pay more than 5.5% of all state receipts. Billionaire David Tepper escaped from New Jersey for Florida in 2015, and other hedge fund managers could follow. Between 2012 and 2016 a net $11.9 billion of income left New Jersey, according to the IRS. The flight risk will increase with the new limit of $10,000 on deducting state and local taxes on federal tax returns. …About two-thirds of New Jersey’s $3.5 billion income outflow last year went to Florida, which doesn’t have an income tax. …The fair question is why any rational person or business that can move would stay in New Jersey. That’s not merely a fair question, it’s a description of what’s already happening. And it’s going to accelerate – in New Jersey and other uncompetitive states – when additional soak-the-rich schemes are imposed (unless politicians figure out a way to put fences and guard towers at the border). A few months ago, I conducted a poll on which state would be the first to suffer a fiscal collapse. For understandable reasons, Illinois was the easy “winner.” But I won’t be surprised if there are a bunch of new votes for New Jersey. Simply stated, the state is committing fiscal suicide. P.S. What’s amazing (and depressing) is that New Jersey was like New Hampshire as recently as the 1960s, with no state sales tax and no state income tax. Even though I wrote about proposed tax increases in Illinois just 10 days ago, it’s time to revisit the issue because the Tax Foundation just published a very informative article about the state’s self-destructive fiscal policy. It starts by noting that the aggregate tax burden is higher in Illinois than it is in adjoining states. Just what are Illinois’ neighbors doing on taxes? They’re taxing less, for starters. In Illinois, state and local taxes account for 9.3 percent of state income. 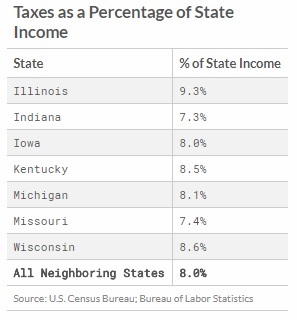 The state and local taxes in Illinois’ six neighboring states account, in aggregate, for 8.0 percent of the income of those states. Here’s the table showing the gap between Illinois and its neighbors. 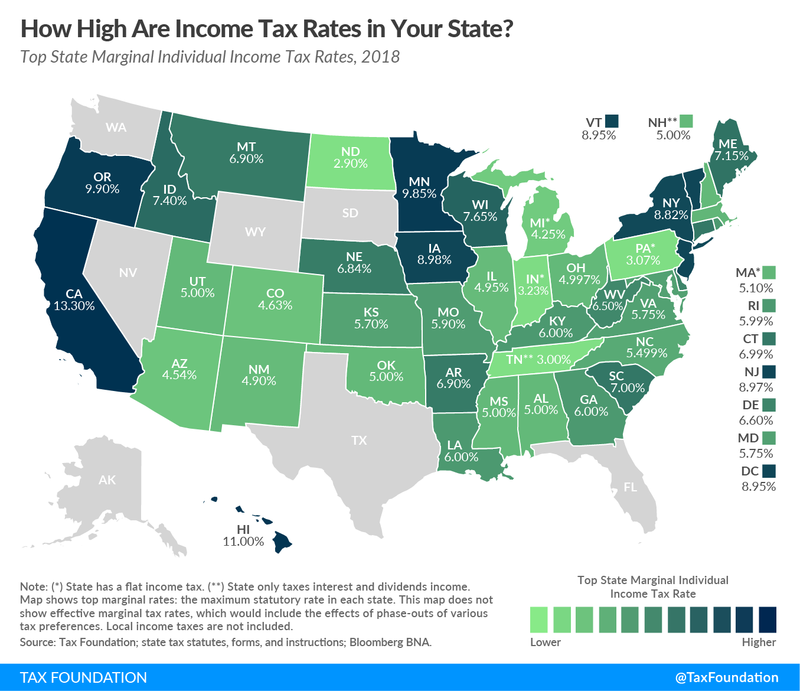 And it’s probably worth noting that the tax gap is the largest with the two states – Indiana and Missouri – that have the longest borders with Illinois. While the aggregate tax burden is an important measure, I’ve explained before that it’s also important to focus on marginal tax rates. After all, that’s the variable that determines incentives for productive behavior since it measures how much the government confiscates when investors and entrepreneurs generate additional wealth. And this brings us to the most important point in the article. Illinois politicians want to move in the wrong direction on marginal tax rates while neighboring jurisdictions are moving in the right direction. Except for Iowa, all of Illinois’ neighbors have cut their income taxes since Illinois adopted its “temporary” income tax increases in 2011—and Iowa is on the verge of adopting a tax reform package that cuts individual income tax rates… Over the same period, Illinois’ single-rate income tax was temporarily raised from 3 to 5 percent, then allowed to partially sunset to 3.75 percent before being raised to the current 4.95 percent rate. A 1.5 percent surtax on pass-through business income brings the rate on many small businesses to 6.45 percent. Now there are calls to amend the state constitution to allow graduated-rate income taxes, with proposals circulating to create a top marginal rate as high as 9.85 percent (11.35 percent on pass-through businesses). 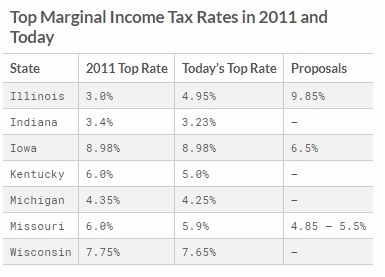 Here’s the chart showing the top rate in various states in 2011, the top rates today, and where top tax rates could be in the near future. What’s especially remarkable is that Illinois politicians are poised to jack up tax rates just as federal tax reform has significantly reduced the deduction for state and local taxes. For all intents and purposes, they’re trying to drive job creators out of the state (a shift that already has been happening, but now will accelerate). Normally, when I write that a jurisdiction is committing fiscal suicide, I try to explain that it’s a slow-motion process. Illinois, however, could be taking the express lane. No wonder readers overwhelmingly picked the Land of Lincoln when asked which state will be the first to suffer a fiscal collapse. P.S. Illinois politicians claim they want to bust the flat tax so they can impose higher taxes on the (supposedly) evil rich. High-income taxpayers doubtlessly will be the first on the chopping block, but I can say with 99.99 percent certainty that class-warfare tax increases will be a precursor to higher taxes on everybody. P.P.S. Illinois residents should move to states with no income taxes. But if they only want to cross one border, Indiana would be a very good choice. And Kentucky just shifted to a flat tax, so that’s another potential option. Here’s a chart showing a very depressing decline in the state’s labor force. By the way, I wonder whether the chart would look even worse if government bureaucrats weren’t included. The Chicago Tribune has a grim editorial about what’s happening. From millennials to retirees, …Illinois is losing its promise as a land of opportunity. Government debt and dysfunction contribute to a weak housing market and a stagnant jobs climate. State and local governments face enormous pension and other obligations. Taxes have risen sharply; many Illinois politicians say they must rise more. People are fleeing. Last year’s net loss: 33,703. In an editorial for the Chicago Tribune, Kristen McQueary correctly worries about the trend. It’s one thing to harbor natural skepticism toward government. It’s quite another to take the dramatic step of moving your family, your home, your livelihood to another state to escape it. But it’s happening. The naysayers and deniers blame the weather. They eye-roll the U-Haul rebellion. They downplay the dysfunction. Good riddance to those stingy taxpayers, they trumpet. But that is a shallow, ignorant and elitist viewpoint that dismisses the thoughtful and wrenching decisions thousands of once-devoted Illinoisans have made. For four years in a row, Illinois has lost population in alarming numbers. In 2017, Illinois lost a net 33,703 residents, the largest numerical population decline of any state. That’s the size of St. Charles or Woodridge or Galesburg. Wiped off the map. In one year. …Policy choices have consequences. …People are fleeing Illinois. And still, Democratic leaders in Chicago and Cook County, and their supporters, generally deny that high taxes, underfunded pensions, government debt and political dysfunction are the reasons for the exodus — or that it’s acute. Newspapers in other states have noticed, as evinced by this editorial from the Las Vegas Review-Journal. When the progressive political class preaches equality and prosperity, but bleeds productive citizens dry by treating them as little more than human ATMs, there should be little surprise when those same citizens take themselves (and their green) to greener pastures. Perhaps no state in the nation is seeing a bigger such exodus than Illinois. 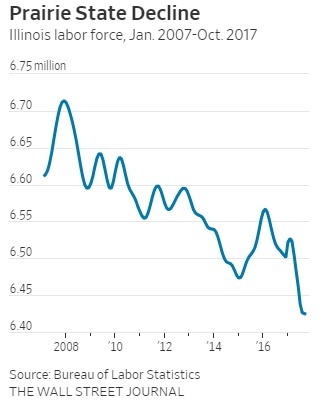 …On the flip side, all of the states surrounding Illinois saw their populations increase… Illinois is experiencing a self-inflicted storm of fiscal distress. …While state income taxes in Illinois don’t reach they level impose in states such as New York and California, that’s not for a lack of trying. The state raised its rate by 32 percent over the summer, and Democrats want to even more progressive tax rates to pay for all the goodies they’ve promised to Big Labor in order to grease their re-elections. …Illinois is a financial basket case — which is what you get when you combine political patronage with powerful public-sector unions that control leftist politicians. The state should be a case study for other jurisdictions on how not to conduct public policy. After all, who will pay the bills when the taxpayers flee? Steve Chapman, in a column for Reason, expects more bad news for Illinois because of pressure for higher taxes. The Wall Street Journal opined on the state’s slow-motion suicide. The only…restraint…on public union governance in Illinois…the state’s flat income tax. …Democrats in Springfield have filed three constitutional amendments to establish a graduated income tax… Democrats are looking for more revenue to finance ballooning pension costs, which consume about a quarter of state spending. …Connecticut and New Jersey provide cautionary examples. Democrats in both states have soaked their rich time and again, and the predictable result is that both states have fewer rich to soak. Economic growth slowed and revenues faltered. This vicious cycle is already playing out in Illinois amid increasing property, income and business taxes. Over the last four years, Illinois GDP has risen a mere 0.9% per year, half the national average and the slowest in the Great Lakes region. Between 2012 and 2016, Illinois lost $18.35 billion in adjusted gross income to other states. …Democrats claim a progressive income tax will spare the middle-class, but sooner or later they’ll be the targets too because there won’t be enough rich to finance the inexorable demands of public unions. …Once voters approve a progressive tax, Democrats can ratchet up rates as their union lords dictate. While a bloated and over-compensated bureaucracy (especially unfunded promises for lavish retiree benefits) is the top fiscal drain, the state also loves squandering money in other ways. Here are some excerpts from a piece in the Belleville News-Democrat. Illinois is the dependency capital of the Midwest. No other state in the region has more of its population dependent on food stamps… So what’s driving the state’s dependency crisis? State bureaucrats using loopholes and gimmicks to keep more people dependent on welfare. According to the Illinois Department of Human Services, nearly 175,000 able-bodied childless adults are on the program. These are adults in their prime working years — between the ages of 18 and 49 — with no dependent children and no disabilities keeping them from meaningful employment. …the state has relied upon loopholes and gimmicks to trap more and more able-bodied adults in dependency. Federal law allows states to seek temporary waivers of the work requirement in areas with unemployment rates above 10 percent or with a demonstrated lack of job opportunities in the region. …the Illinois Department of Human Services…used old data and it gerrymandered the request in whatever way was necessary to keep more able-bodied adults on welfare. …State bureaucrats have gamed the system and as a result, thousands of able-bodied adults will remain trapped in dependency, with little hope of better lives. Let’s close with some excerpts from a very depressing column in the Chicago Tribune by Diana Sroka Rickert. …this is a state government that has been broken for decades. It is designed to reject improvement in every form, at every level. …The Thompson Center… is a near-perfect representation of state government. It is gross, rundown, and nobody cares. …there is a disturbing sense of entitlement among some state employees. …Underperformers aren’t fired; they’re simply transferred to different positions, shuffled elsewhere on the payroll or tucked away at state agencies. …this is a state government that is ranked last by almost every objective and measurable standard. A state government that fails every single one of its residents, day after day — and has failed its residents for decades. A state government that demands more and more money each year, to deliver increasingly less value. Keep in mind, incidentally, that all this bad news will almost certainly become worse news thanks to last year’s tax reform. Restricting the state and local tax deduction means a much smaller implicit federal subsidy for high-tax states. P.S. If you want good news on state tax policy, South Dakota may have the nation’s best system. And North Carolina arguably has taken the biggest step in the right direction. Kentucky, meanwhile, has just switched to a flat tax.